The first execution is a “service” strategy. The ad touts the all-out service, effort, and dedication you will receive at McArdle regardless of the services provided (or your political affiliation). This ad is broader and covers services such as printing, marketing, communications, mailing lists, and more. 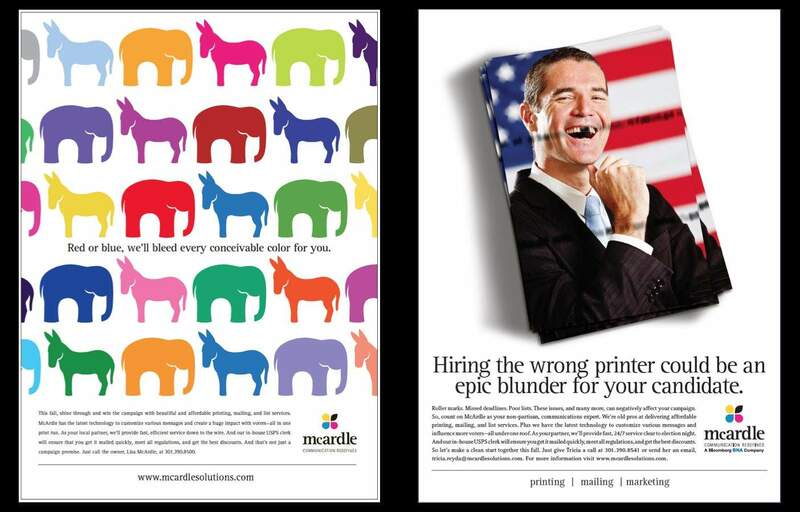 The tone of this print ad is smart, poetic, and it takes the higher ground of not picking sides in politics. The second execution is a “printing expertise” strategy. Printing is the original and core service provided by McArdle, although the company has expanded its offerings in recent years. So, this ad capitalizes on the company’s origins and what they are known for: high quality printing and careful service on the press. The tone of this ad is fun, humorous, and it pokes fun at politicians who often have cheesy smiles. Which solution would you choose? Why? Feel free to leave a comment below about our creative political advertising in DC. Dean Creative is a virtual print and digital advertising agency in Los Angeles, CA with a location in Washington, DC. It has helped develop creative political advertising in DC for advocacy groups and cause marketing agencies. Dean Creative’s partners are independent freelancers working together in teams to serve clients more creatively and cost-effectively. Dean Creative serves clients on both coasts in entertainment, high-tech, healthcare, sports marketing, associations, nonprofits, and more. The principal is Brian Dean, freelance creative director and copywriter. Co-principal is Peggy Kearns Dean, a senior copywriter, editor, and proofreader. Other creative partners include freelancers in brand strategy, graphic design, art direction, videography, web development, social media, and web marketing. Dean Creative began in spring 2000 by Brian Dean as a freelance copywriting service in Alexandria, VA (in metropolitan Washington, DC). Before long, Dean partnered with other freelancers to provide creative services to advertising agencies, design firms, businesses, and nonprofits that need added creative support. In 2011, Dean Creative opened a location in Santa Monica, CA just outside Los Angeles. Learn more at deancreative.com.